What does the book offer you? What is Be Loved, Beloved about? Katherine T Owen (the author of this spiritual website) spent 14 years severely disabled with ME/CFS, living with inadequate care. At times when life seems against us, how can we love ourselves? takes the reader with Katherine T Owen on her journey to know God’s love and self love. Available globally on kindle. Go here for Kindle. I recommend the paperback rather than the e-book. It is deliberately designed as a small book, perfect to hold in your hands whilst allowing yourself to receive God's love. The beautiful abstract painting on the cover adds to the power of reading from the book during your quiet times. Several people have reported receiving healing from the book, just by holding it against their body. The paperback of Be Loved, Beloved is available online globally. At the time of the writing, the price of the paperback book online is UNDER £6 or $6 or €6. Other currencies are also available. Postage is, I think, £2.99 OR $ Or € equivalent. Talking to Jennifer Alhasa on the Get Glowing Radio show Katherine talks of a practical spirituality that encourages us to reach for Love in the midst of difficulties. She reads spiritual love poems from Be Loved, Beloved. "We are on a journey to undo the blocks to the awareness of God’s love." "Instead of depending on the other for love we look to God. When we receive God's love we know better what love feels like. We are freed up to allow the other person to love us." "We build our life on the love that glows behind everything." "In the moments of falling into God I didn't care about getting better." "Sometimes it takes the body not functioning to remember we are spiritual beings." "The trick is to hear God’s invitation without needing to create drama in our life before we listen!" "God turns cartwheels of delight. It's OK to enjoy being enjoyed." "The spiritual journey is the move from independence to dependence on God." 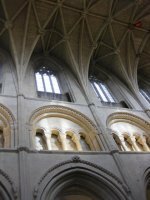 "Sometimes when we are ill we feel we are not contributing, but to let God in is an amazing service to everyone." "Dear God, I allow you to love me." "Let go of trying to be loved. Just step into the Love that is here." "And now there is no need for words. I feel His Love. I am Love." Who is the book Be Loved, Beloved – 15 Spiritual Love Poems for? Does God love me? How can I love myself? For those who seek to know God's love and to learn how to love yourself. A perfect gift for someone living with illness and learning self love. A spiritual valentines gift to a friend. A gift for your partner. These spiritual love poems are simple, yet powerful. Personal, yet universal. The releases remove the blocks to allowing yourself to be loved. The poems and quotes about God's love take you further into receiving God's love. 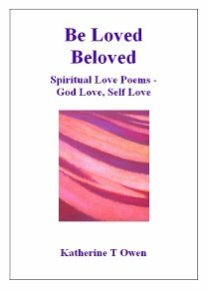 This collection of spiritual love poems takes us with Katherine T Owen on the journey she has made to know God’s love and move towards self love. This journey was triggered by the testing circumstances of fourteen years living with the illness CFS / ME combined with inadequate care. With little speech or movement, fighting to survive, she explored spirituality to find peace. She would not trade those difficult years for the knowledge gained of God’s love. 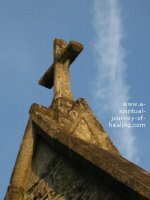 In the tradition of the mystics, Katherine T Owen writes about direct spiritual experience. The poems take us with her through both her resistance and surrender to the love that brings true healing. 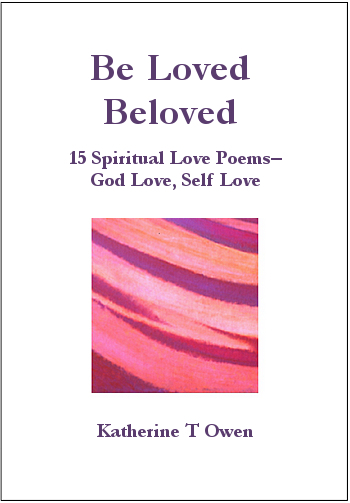 Each of the spiritual love poems in Be Loved, Beloved is accompanied by both a spiritual quote about love (Bible verse or A Course In Miracles quote) and a release about love. “God is love. On some level I knew this. If I felt unloved, the fault did not lie with a God who did not know how to love me. It must be my own beliefs that were simply blocking out my awareness of that love. Here you will find love poems to God, love poems from God, love poems to and from myself. calling me by my name. I realise He has said this all along. “I love you,” He says. a punishment for my ingratitude. Will I do that for Him? Will I receive His love? It's OK to find it hard to receive someone's love. © Katherine T Owen, 2009. For a discussion on how to use spiritual quotes. “From [Katherine’s] sparse words emerges the picture of a woman who had the wall between God and herself removed, one revelation at a time. One poem at a time. One thing that struck me was the stripping of ego in the work. Most of us have a comfy ego façade, but weakness and disease tore Katherine’s away. Her poems come from the heart. "This little modest pocket-book is packed with tiny, illuminating gems!" “Through her traumatic journey and her enlightened response to adversity, a divine spirit has developed Katherine's charismatic personality into a consummate teacher, a caring spiritual guide, with an ecstatic message of hope, freedom and love. Read about Katherine T Owen’s book on a journey with Faith and Reason.